Smoky Quartz: Mineral information, data and localities. 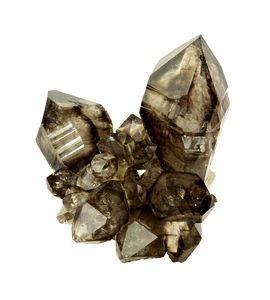 A smoky-gray, brown to black variety of quartz that owes its color to gamma irradiation and the presence of traces of aluminum built into its crystal lattice (Griffiths et al, 1954; O'Brien, 1955). The irradiation causes the aluminum Al(+3) atoms that replace Si(+4) in the lattice in a [AlO4]- group to transfer an electron to a neighboring monovalent cation (often Li+) and form a [AlO4/Metal0]0 color center (O'Brien, 1955). The name Morion is used for black smoky quartz. Smoky quartz is dichroic (from darker yellow-brown to lighter red-brown) when viewed in polarized light. 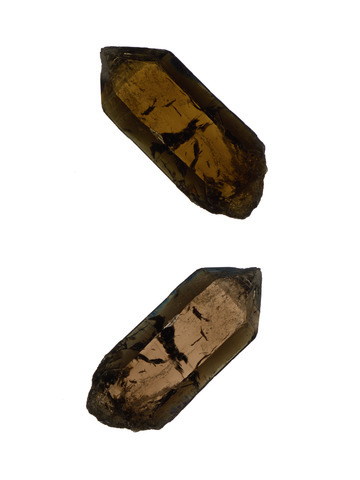 The photo to the left shows the change of color in a smoky quartz crystal that is rotated in front of an LCD display that serves as a source of polarized light. 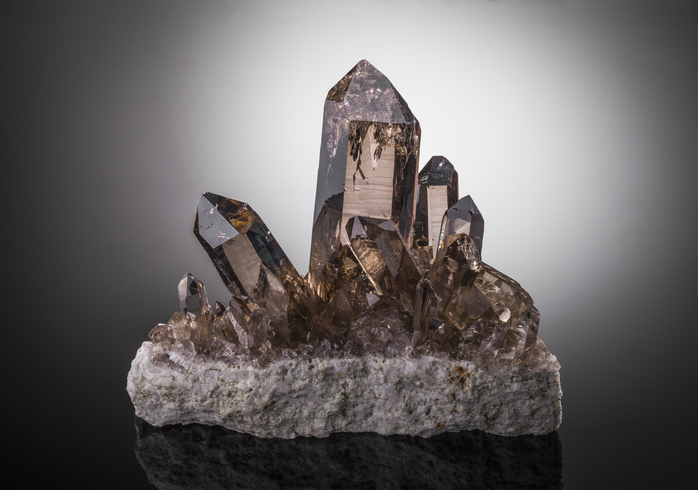 The color of smoky quartz is sensitive to heat and will pale at temperatures above 200-300°C or by prolonged exposure to UV light. This loss of color can be reverted by gamma irradiation of the crystals. Smoky quartz can be found in many different environments but is most characteristic for pockets in igneous rocks and pegmatites. The quartz grains in granites and related rocks are often smoky. Smoky quartz shows many different habits and crystallographic forms, but needle-like crystals of smoky color are not known. Crystals that grew at relatively high temperatures, in particular macromosaic quartz crystals like those found in pegmatites and alpine-type fissures are often evenly colored, whereas crystals from other environments often show a color zonation in the form of multiple phantoms. In scepters and skeleton quartz, the color may be more intense along the edges of the crystal. Note: Very often black or brown crystals that are colored by inclusions of minerals or organic matter are erroneously called "smoky quartz" or "morion". Typical examples of such misnomers are black quartz crystals embedded in sedimentary rocks, like those found in gypsum, anhydrite, and limestone in Italy and Spain. 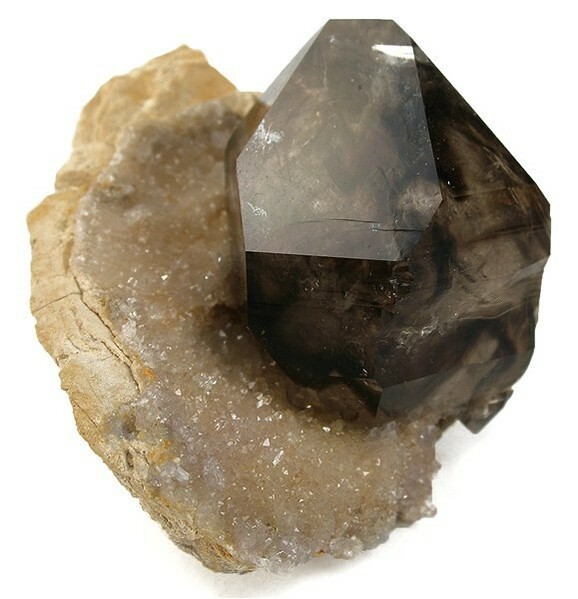 True smoky quartz can be distinguished from crystals that are colored by inclusions by its dichroism. Visit gemdat.org for gemological information about Smoky Quartz. Microcline 663 photos of Smoky Quartz associated with Microcline on mindat.org. Spessartine 654 photos of Smoky Quartz associated with Spessartine on mindat.org. Amethyst 556 photos of Smoky Quartz associated with Amethyst on mindat.org. Albite 520 photos of Smoky Quartz associated with Albite on mindat.org. Fluorite 318 photos of Smoky Quartz associated with Fluorite on mindat.org. Muscovite 307 photos of Smoky Quartz associated with Muscovite on mindat.org. Schorl 265 photos of Smoky Quartz associated with Schorl on mindat.org. Amazonite 252 photos of Smoky Quartz associated with Amazonite on mindat.org. Hematite 250 photos of Smoky Quartz associated with Hematite on mindat.org. Orthoclase 233 photos of Smoky Quartz associated with Orthoclase on mindat.org. Quartz is usually quite harmless unless broken or powdered. Broken crystals and masses may have razor-sharp edges that can easily cut skin and flesh. Handle with care. Do not grind dry since long-term exposure to finely ground powder may lead to silicosis. Griffiths, J.H.E., Owen, J., Ward, I.M. (1954) Paramagnetic resonance in neutron-irradiated diamond and smoky quartz. Nature: 173: 439-442. O'Brien, M.C.M. (1955) The structure of the colour centres in smoky quartz. Proceedings of the Royal Society of London. Series A, Mathematical and Physical Sciences: 231: 404-414. Marshall, Royal R. (1955) Absorption spectra of smoky quartz from an Arkansas vein deposit and from a Sierran miarolitic granite. American Mineralogist: 40: 535-537. Chudoba, K.F. (1962) Some relations between the causes of amethyst, smoky quartz, and citrine colors as given by modern science. Mineralogicheskii Sbornik (Lvov): 16: 91-105. Cohen, A.J., Makar, L.N. (1982) Models for color centers in smoky quartz. Physica Status Solidi (A): 73: 593-596. Partlow, D.P., Cohen, A.J. (1986) Optical studies of biaxial Al-related color centers in smoky quartz. American Mineralogist: 71: 589-598. Cohen, A.J. (1989) New data on the cause of smoky and amethystine color in quartz. Mineralogical Record: 20: 365-367. The following Smoky Quartz specimens are currently listed for sale on minfind.com. Padrón de Minas de la Provincia de Catamarca. Raúl Jorge Tauber Larry; Hugo A. Peña (1970): Minerales y rocas de aplicación de la Provincia de Tucumán. Secretaría de Estado de Comercio, Industria y Minería. Dirección Provincial de Minas. Tucumán. República Argentina. Metallogenic Study and Mineral Deposit Data Sheets: Inverell Metallogenic Map (SH/56-5), Geological Survey of New South Wales, 1997: RE Brown, WJ Stroud and JW Brownlow. Published by the Geological Survey of New South Wales. Warwick–Tweed Heads Exploration Data Package Vol. 2, Mineral occurrence data sheets, occurrence lists and mineral occurrence maps: R.E. Brown, H.F. Henley and W.J. Stroud, December, 2001. Published by the Geological Survey of New South Wales. Warwick – Tweed Heads Exploration Data Package Vol. 2, Mineral occurrence data sheets, occurrence lists and mineral occurrence maps: R.E. Brown, H.F. Henley and W.J. Stroud, December, 2001. Published by the Geological Survey of New South Wales. Brown, R.E., H.F. Henley and W.J. Stroud: Warwick–Tweed Heads Exploration Data Package Vol. 2, Mineral occurrence data sheets, occurrence lists and mineral occurrence maps, December, 2001. Published by the Geological Survey of New South Wales (GS2001/087). Brown, R.E., Brownlow, J.W. and Stroud, W.J. (1997) Metallogenic Study and Mineral Deposit Data Sheets: Inverell Metallogenic Map (SH/56-5). Published by the Geological Survey of New South Wales. Metallogenic Study and Mineral Deposit Data Sheets: Grafton-Maclean Metallogenic Map, Geological Survey of New South Wales, 2001: HF Henley, RE Brown, JW Brownlow, RG Barnes and WJ Stroud. Barnes R.G., Brown R.E., Brownlow J.W., Henley H.F., and Stroud W.J. (2001) Metallogenic Study and Mineral Deposit Data Sheets: Grafton-Maclean Metallogenic Map (SH/56-6, SH/56-7). Published by the Geological Survey of New South Wales. Personal collection of Keith Compton. Daly, J., Dyson, D.F. (1956) Geophysical Investigations for Radioactivity in the Harts Range Area, Northern Territory, Department of National development/Bureau of Mineral Resources Geology and Geophysics, Commonwealth of Australia, Report No.32. Drake-Brockman, J. (1995) Harts Range Project Annual Report 1994, Vol. 1, PNC Exploration (Australia) Pty Ltd. (CR 95/298A). ⓘ Blackfellows' Bones Mine ? Thompson, D. (ed) (1986) A Guide to Fossicking in the Northern Territory. Northern Territory Geological Survey, Northern Territory Department of Mines and Energy, 2nd ed., 73p. Davie-Smythe, M., & Hardwick, B. (2008). Annual report for EL 24709 and EL 24710'Wave Hill Project'for the period 30 December 2007 to 29 December 2008. Barnes L. C., et al, (1980), Some Semiprecious and Ornamental Stones of South Australia, Government Printer, Adelaide, South Australia. Toma, J. (2017): Mineral news from South Australia. Australian Journal of Mineralogy 18 (1), 68. Bottrill, R. S., Woolley, R. N., & FORSYTH, A. (2004). Topaz from Killiecrankie, Flinders Island, and other Bass Strait Islands. Australian Gemmologist, 22, 2-9. Cochrane, G. W., Bowen, K. G. (1971) Tin deposits of Victoria (No. 60). Geological Survey of Victoria Bulletin No. 60. Calderwood, M.A., Grguric, B.A., Jacobson, M.I. (2007) Guidebook to the Pegmatites of Western Australia. Hesperian Press, Carlisle, Western Australia. Groß, W. (1983) Mineralien suchen - Mineralien finden: "Wer immer grabend sich bemüht" - Mineralien von Hüttenberg / Kärnten. Mineralien-Magazin, 9/1983, 419-423. Niedermayr, G., Praetzel, I. (1995) Mineralien Kärntens. ; Walter, F., Ettinger, K. (2005) The origin of hollow tubes in Alpine quartz crystals. 3rd Symposion of the Hohe Tauern National Park for Research in Protected Areas, 245-249. Huber, S. & Huber, P. (1982): Quarzkristalle aus dem Nordostrand der Alpen / Vorkommen von Quarzkristallen im südlichen Niederösterreich und in angrenzenden Gebieten der Steiermark sowie des Burgenlandes. Die Eisenblüte, NF Jg. 3, Nr. 5, 14–25. KIESEWETTER, Ludwig (1996a): Ambach/NÖ.. Ein Fundstellenporträt.- Mefos, 7/12, 4-19, Wien. NIEDERMAYR, G., C. AUER, F. BERNHARD, H.-P. BOJAR, F. BRANDSTÄTTER, A. ERTL, K. ETTINGER, V. M. F. HAMMER, B. LEIKAUF, W. POSTL, M. SABOR, R. SCHUSTER, R. SEEMANN & F. WALTER (2005): Neue Mineralfunde aus Österreich LIV. – Carinthia II, 195./115. : 277-315. Huber, S. & P. (1984): Mineralfunde aus dem Norden und Osten Österreichs. Neuigkeiten und Ergänzungen zu ausgewählten Fundbereichen / Folge 1.- Die Eisenblüte, 5/11, 27-29, Graz. KIESEWETTER, Ludwig & KNOBLOCH, Gerald (2003): Die Minerale des Raumes Spitz/Donau.- Mefos, 14/26, 4-22, Wien. Kolitsch, U., Löffler, E., Pristacz, H. & Brandstätter, F. (2010): 1654) Triplit und weitere Mineralien aus einem anstehenden Pegmatit im Mieslingtal bei Spitz, Waldviertel, Niederösterreich. P. 241 in Niedermayr et al. (2010): Neue Mineralfunde aus Österreich LIX. Carinthia II, 200./120., 199-260. Kolitsch, U. & Brandstätter, F. (2010): 1651) Bavenit, Stellerit und weitere Mineralien vom Truppenübungsplatz Allentsteig, Waldviertel, Niederösterreich. Pp. 238-239 in Niedermayr et al. (2010): Neue Mineralfunde aus Österreich LIX. Carinthia II, 200./120., 199-260. HUBER, Simone & HUBER, Peter (1977a): Mineralfundstellen. Band 8. Oberösterreich, Niederösterreich und Burgenland.- 271 S., München - Innsbruck (Christian Weise, Pinguin). KÖRNER, Amand (2006): Rauchquarz und Beryll aus dem Gebiet um Heidenreichstein.- Mefos, 17/31, 7-11, Wien. Brandstätter, F. (1987): 678. Schöne Kristalle von Albit, Mikroklin und Rauchquarz aus einem Pegmatit von Burgerwiesen bei Horn, Niederösterreich. Pp. 312-313 in Niedermayr, G., Brandstätter, F., Moser, B. & Postl, W. (1987): Neue Mineralfunde aus Österreich XXXVI. Carinthia II, 177./97., 283-329. KNOBLOCH, Gerald (1993): Quarzfundstellen im Waldviertel.- In: VEREIN MONTANIA (Hrsg. ): Bergkristalle. Funde & Fundstellen. 1. Teil. Burgenland - Niederösterreich - Oberösterreich - Steiermark, Die Eisenblüte, Sb. 6, 10-26, Graz. STEININGER, Fritz F. & STÜRMER, Franz (Hrsg.) (1990): Waldviertel - Kristallviertel. Katalog zur Sonderausstellung.- Katalogr. Krahuletz-Mus., 11, VI + 182 S., 10 Taf., Eggenburg. Knobloch, G. (2007): Maissauer Amethyst - Formen, Farben, Faszination. - Bode Verlag, Germany, 96 p.
KIESSLING, Franz (1930b): Das Steinreich im Gebiete der Horner Hauptmannschaft und in angrenzenden Gebietsstreifen.- In: KIESSLING, Franz: Das Steinreich des niederösterreichischen Waldviertels mit besonderer Berücksichtigung des Gebietes der Horner Hauptmannschaft, 11-77, Wien (Roland). Carinthia II, 193./113 (2003) 195-216. BRANDSTÄTTER, Franz & NIEDERMAYR, Gerhard (2003): 1331) Wolframoixiolith von Maigen, Niederösterreich.- In: NIEDERMAYR, Gerhard et al. : Neue Mineralfunde aus Österreich LII, Carinthia II, 1, 193/113, 203. Kugler, A. (1997): Waldviertel Aktuell: Hörmanns. MEFOS Nr. 14, 17. Walter, F. (2010): 1645) Brannerit vom Plattenkogel und vom Schwarzkopf, Anlauftal, Salzburg und vom Waidsfeldkees, Hollersbachtal, Salzburg. Pp. 232-233 in Niedermayr et al. (2010): Neue Mineralfunde aus Österreich LIX. Carinthia II, 200./120., 199-260. Strasser, A. (1989) Die Minerale Salzburgs. ; Walter, F., Ettinger, K. (2005) The origin of hollow tubes in Alpine quartz crystals. 3rd Symposion of the Hohe Tauern National Park for Research in Protected Areas, 245-249. Harjo Neutkens collection; Niedermayr, G. & Brandstätter, F. (2000): 1221. Harmotom, Fluorit, Galenit, Cerussit sowie Hydrocerussit, Rauchquarz und Wulfenit aus dem Bereich von „Russland" in der Scharn, Hollersbachtal, Salzburg. Pp. 206-207 in Niedermayr et al. (2000): Neue Mineralfunde aus Österreich XLIX. Carinthia II, 190./110., 181-224. A. Strasser: Die Minerale Salzburgs (1989); Niedermayr, M. (1993): 915. Bertrandit und Milarit vom Schafkogel im Hollersbachtal, Salzburg. P. 277 in NIEDERMAYR, G., F. BRANDSTÄTTER, B. MOSER, W. H. PAAR, W. POSTL, J. TAUCHER & H.-P. BOJAR (1993): Neue Mineralfunde aus Österreich XIIL. Carinthia II, 183./103. : 265-290. Franz Walter, Hubert Fink, Ludwig Rasser (2011) Mineralienfunde von der Goldberg-Spitze in der Sonnblickgruppe. Mineralienwelt 6/2011: 62 -65. Grolig, D., Niedermayr, G. (2003) Interessante Mineralfunde aus dem Grossarntal, Land Salzburg, Österreich. Minealien Welt: 14(1): 38-48. Postl, W., Taucher, J. & Moser, B. (1996): Neue Mineralfunde im oststeirischen Vulkangebiet. Mitt. Abt. Miner. Landesmuseum Joanneum, 60/61, 3-76. Postl, W. & Moser, B. (1988): Mineralogische Notizen aus der Steiermark. Mitt. Abt. Miner. Landesmuseum Joanneum, 56, 5-47.; R. Exel: Die Mineralien und Erzlagerstätten Österreichs (1993); Tomazic, P. (2010): Interessante Funde von Schörl, Fluorit und weiteren Mineralien im Gneissteinbruch bei Hadersdorf im Mürztal, Steiermark. Der Steirische Mineralog, H. 24, 13-16. Meixner, H. (1973): 290. Axinit, Prehnit vom Knorrenkees, Osttirol. P. 119 in Meixner, H. (1973): Neue Mineralfunde in den österreichischen Ostalpen, XXIV. Carinthia II, 163./83., 101-139. Ortner, L. (2006): Die Faktoren des Glücks - Eine Strahlertour im Tuxertal, Nordtirol. Lapis, 31 (5), 36-37. - Erich J.Zirkl, in: Die OÖ. Mineraliensammlung Otmar Wallenta. Anselm Desing Verein, Naturwissenschaftliche Sammlung Kremsmünster, Nummer 31, 1995. 52 Abbildungen, 87 Seiten. Brandstetter, G. & M. Reich (1998): Luftenberg - eine bedeutende Pegmatitmineralisation in Oberösterreich. OÖ. Geonachr. 13, 11-25; Brandstetter, G. & Reich, M. (1999): Luftenberg - eine bedeutende Pegmatitmineralisation in Oberösterreich. Mineralien-Welt 10 (3), 12-18. - H.Haider, Gesteine und Minerale des Mühlviertels. In: Heimatbuch Luftenberg an der Donau. Herausgeber Heimatverein und Gemeinde Luftenberg an der Donau, Luftenberg 1997, 4 Abbildungen, Seite 20 - 23 (453 Seiten). Rob Lavinsky. ; Lieber, W. (1977) Charakteristisch oder bedeutungslos? Die Farbe von Mineralien. Mineralien-Magazin, 1, 17-23. Proctor, K. (1984). Gem pegmatites of Minas Gerais, Brazil: exploration, occurrence, and aquamarine deposits. Gems and Gemology, 20(2), 78-100. Ferreira, A., Ferreira, V. P., Soares, D. R., & Vilarroel-Leo, H. S. (2005). Chemical and mineralogical characterization of elbaites from the Alto Quixaba pegmatite, Seridó province, NE Brazil. Anais da Academia Brasileira de Ciências, 77(4), 729-743.
de Brito Barreto, S., & Bretas Bittar, S. M. (2010). Los depósitos de gemas de Brasil: localización, producción e impacto económico. Boletín de la Sociedad Geológica Mexicana, 62(1), 123-140.
e Souza, M. B. D. A., França, R. H. M., & de Lira, L. C. M. (2016, July). Vieirópolis Pegmatite Field, Northwest of Paraíba State, Brazil: New Occurrences of Amazonite Pegmatites. In Second Eugene E. Foord Pegmatite Symposium (p. 24). Beurlen, H.; Müller, A.; Silva, D.; Da Silva, M.R.R. (2011): Petrogenetic significance of LA-ICP-MS trace-element data on quartz from the Borborema Pegmatite Province, northeast Brazil. Mineralogical Magazine 75, 2703-2719. ; de Brito Barreto, S., & Bretas Bittar, S. M. (2010). Los depósitos de gemas de Brasil: localización, producción e impacto económico. Boletín de la Sociedad Geológica Mexicana, 62(1), 123-140. Stela Atanasova – Vladimirova, Aleksi Sekiranov (2007) “New Hope” Pegmatite Vein from Arda Region, the Central Rhodopes, Bulgaria. Fourth International Symposium Mineral Diversity Research and Preservation pp201-206. I. Kostov, V. Breskovska, J. Mincheva-Stefanova, G. Kirov (1964): Minerals of Bulgaria. Sofia, Bulgaria, 540 pp. (in Bulgarian). Mauthner, M.H.F. et al. (1996) Minerals of the Silvana Mine Sandon British Columbia. Mineralogical Record, 27(6):433-438. Phillips, K. A. (1978) Minerals of Manitoba: Vol 1 Nonmetallic and pegmatic. Manitoba Mineral Resources Division Educational Series 78/1. Phillips, K. A. (1978) Minerals of Manitoba: Vol 1 Nonmetallic and pegmatic. Manitoba Mineral Resources Division Educational Series 78/1; Bannatyne, B. B. (1985). Industrial minerals in rare-element pegmatites of Manitoba (Vol. 84, No. 1). Manitoba Energy and Mines, Geological Services. Bannatyne, B. B. (1985). Industrial minerals in rare-element pegmatites of Manitoba (Vol. 84, No. 1). Manitoba Energy and Mines, Geological Services. Sabina, A.P. (1994) Rocks and Minerals for the Collector - Northeastern Nova Scotia, Cape Breton, and Prince Edward Island. Geological Survey of Canada, Reissue of Paper 65-10. E.R. Faribault, "Lunenberg County, Nova Scotia", Summ. Rep. Geol. Surv. Dep. Canada for 1907, pp. 80-82, 1908. Satterly J. (1943) Mineral Occurrences in the Haliburton Area, Ontario Department of Mines, Annual Report ARV52, Pt.2, p.61. Schroetter, Ralph. The Bancroft & Area Mineral Collectors Guide. Page 172. Ref. : Geological Survey of Canada Miscellaneous Survey 39. Ref. : Geological Survey of Canada Miscellaneous Report 39. Satterly J. (1956) Radioactive Mineral Occurrences in the Bancroft Area, Ontario Department of Mines, Annual report ARV65, pt.6, p.98-99. Storey C.C. and Vos M.A. (1981) Industrial minerals of the Pembroke-Renfrew area, Ontario Geological Survey, Mineral Deposit Circular 22, pt.2, p.135. Identified by Mineral Associates Inc.
Marmont C., Johnston M. 1987. Mineral Deposits Studies in the Huntsville-Parry Sound- Powassan Area, Ontario Geological Survey, Open File Report 5647, p.88. Eberhardt William Heinrich (1959): Sphene-allanite pegmatites of Griffith Township, Renfrew County, Ontario. Can. Mineral. 6, 339-347. Carter T. R., Colvine A.C. and Meyn H.D. (1980) Geology of Base Metal, Precious Metal, Iron, and Molybdenum Deposits in the Pembroke-Renfrew Area, Ontario geological Survey, Mineral Deposits Circular 20, p. 162. Satterly J. (1944) Mineral Occurrenes in the Renfrew Area, Ontario Department of Mines, Fifty - Third Annual Report, ARV53, Pt.3, P.33. Robert Hauck, Sterling Hill Mining Museum, based on data provided by current owner. Vos, M. A., 1976, Amethyst Deposits of Ontario, Ontario Division of Mines, pp. 99..
Sabina, A.P. (1983) Rocks & Minerals for the collector; Kingston, Ontario to Lac St-Jean, Quebec. GSC Misc. Report 32, 65-66 p.; Sabina, A.P. (1983) Rocks & Minerals for the collector; Kingston, Ontario to Lac St-Jean, Quebec. GSC Misc. Report 32, 65-66 p.
Jun Zhou, Ping Han, Lei Liu, Qinhu Tian, and Decheng Li (2006): Resource Geology 57(1), 76-89. Jiang Neng, Xu Jiuhua, and Song Mianxin (1999): Mineralium Deposita 34(2), 150-162. Liqiang Yang, Jun Deng, Jing Zhang, Qingfei Wang, Bangfei Gao, Yinghua Zhou, Chunying Guo, and Shaoqing Jiang (2007): Acta Petrologica Sinica 23(1), 153-160. Jewel Tunnel morion specimens, acquired in China, 2016. Yanling Tang (2005): Non-metallic deposits of Xinjiang, China [Zhongguo Xinjiang Fei Jinshu Kuangchuang]. Geological Publishing House (Beijing), 289 pp. Khin Zaw, Peters, S.G., Cromie, P., Burrett, C., and Zengqian Hou (2007): Ore Geology Reviews 31, 3-47. Povondra, P., Pivec, E. (eds.) et al. : Přibyslavice peraluminuous granite. Acta universitatis carolinae, Geologica, 1987, no. 3, s . 183 – 283. Fišera M.: Nerosty alpské parageneze od Sudějova u Uhlířských Janovic (okres Kutná Hora). Časopis pro mineralogii a geologii, 1963, 8, 2, 213. Novak, M., Kadlec, T., & Gadas, P. (2013). Geological position, mineral assemblages and contamination of granitic pegmatites in the Moldanubian Zone, Czech Republic; examples from the Vlastejovice region. Journal of Geosciences, 58(1), 21-47. Kutina J. (1944): Nové nálezy nerostů na Říčansku a Jílovsku. Věda přírodní, č. 2, s. 33-41. Pauliš, P.: Nejzajímavější mineralogická naleziště Čech. Kutná Hora: Kuttna, 2000, s. 61. Černý, P., Veselovský, F.: Pegmatit Bílý kámen (Weisser Stein) u Kynžvartu. Minerál, 2000, roč. 8, č. 1, s. 10-16. Fengl, M.: Mineralogie těžených fluoritových ložisek (1.). Minerál, 1998, 6, 2, 243–252. Horáček, J., Chabr, P.: Nové minerály pegmatitových žil z Liberce - Ruprechtic. Sborník Severočeského musea, Přírodní vědy, 1973, roč. 5, s. 27-33. Fengl, M.: Mineralogie těžených fluoritových ložisek (1.-5.). Minerál, 1998-1999, roč. 6-7, č. 2, 4, 6, 1, 3. Pauliš, P.: Nejzajímavější mineralogická naleziště Čech II. Kutná Hora: Kuttna, 2003, s. 49-50. Kruťa, T.: Nerostný výzkum ve Slezsku v letech 1956-1957. Přírodovědecký sborník Ostravského kraje, 1957, 18, 543-571. Rusek P., Valošek Č.: Zpráva o výsledku mineralogicko-geologických pochůzek v okrese Karviná a Frýdek Místek (Část 20., květen-červen 1965). Zprávy Okresního muzea v Českém Těšíně, 1965, č. 35, s. 7-10. Smutný, Z.: Hončova hůrka – stav lokality a nálezy minerálů v letech 1995 – 1996. Časopis Slezského musea, series A: vědy přírodní, 1997, roč. 46, č. 2. s. 188 – 189. Kruťa, T.: Nerostný výzkum ve Slezsku v roce 1954. Přírodovědecký sborník Ostravského kraje, 1955, roč. 16, č. 1, s. 125-138. Kruťa, T.: O nerostech, nerostných surovinách a předních nalezištích ve Slezsku. Přírodovědecký sborník Ostravského kraje, 1949, roč. 10, s. 281-319. Kruta, T.: Mineralogicke a loziskove pomery v Lesni Ctvrti u Vapenne ve Slezsku. Acta Musei Moraviae, Scientiae Geologicae, 1961, roč. 46, s. 5 - 20. Kruťa, T.: Mineralogický výzkum ve Slezsku v roce 1958. Přírodovědný časopis Slezský, 1959, roč. 20, č. 3, s. 367-381. Kruťa, T.: Geologicko-mineralogické poměry okolí Velké Kraše a nerostné suroviny z vidnavské oblasti. Přírodovědecký sborník (Sborník Přírodovědecké společnosti v Ostravě), 1936-1946, roč. 9, s. 52-69. Novák, M.: Maršíkov - Scheibengraben. In Exkurzní průvodce po mineralogických lokalitách na Sobotínsku. Univerzita Palackého v Olomouci, 2002, Olomouc, s. 38-41. Fengl, M.: Mineralogie těžených fluoritových ložisek (2.). Minerál, 1998, roč. 6, č. 4, s. 243-252. Nováček, R: Minerály pegmatitů a sousedních hornin z Budislavě ve východních Čechách. Časopis Národního musea, Oddíl přírodovědný, 1928, roč. 102, s. 91-95. Janouš, F.: Minerály z Kněží hory u Těškova (okres Rokycany), Minerál, 1995, roč. 3, č. 6, s. 367-369. Welser, P.: Minerály muskovit-biotitických pararul u Omlenic a Malého Stradova na Kaplicku. Sborník Jihočeského muzea v Českých Budějovicích, Přírodní vědy, 1996, roč. 36, s. 5-10. ZIKEŠ J., WELSER P. (2007): Jihočeské minerály a jejich produktivní lokality. −Minerál, 15, 1, 56-66. Morávek P., Litochleb J., Sejkora J., Škoda R.: Pegmatity s molybdenitem u Skalska na Jílovsku, ČEská republika - historie, geologie a mineralogie. Bulletin mineralogicko-petrografického oddělení Národního muzea v Praze, 2010, 18, 2, 32-42. Novák, J.: Výskyt rutilu západně od Golčova Jeníkova. Věstník ÚÚG, 1959, roč. XXXIV, s. 409 - 415. Losert, J.: Nové nálezy pegmatitů na Chotěbořsku. Časopis pro mineralogii a geologii, 1978, roč. 23, č. 4, s. 435-436. Fišera, V., Novotný, P.: Nerosty z pegmatitů ze Světlé nad Sázavou. Časopis pro mineralogii a geologii, 1980, roč. 25, č. 1, s. 97. Houzar, S., Pošmourný, K.: Ag-Pb-Zn rudní mineralizace u Jemnice na jihozápadní Moravě. Acta Musei Moraviae, Scientiae naturales, 1991, roč. 76, s. 95 - 103. Houzar S., Kafka B., Nehyba S., Vokáč M.: Vltavínonosné sedimenty v okolí Náměště nad Oslavou. Přírodovědný sborník Západomoravského muzea v Třebíči, 1997, 31, 125-131. Novák M., Mazuch J. (1987): Nový lithný pegmatit z Dolní Rožínky. Acta Musei Moraviae, Sci. nat., 72, 257-258. Sekanina, J.: Nerosty moravských pegmatitů. Časopis Moravského zemského musea, 1929-1930, sv. 26-27, s. 113-224. Staněk, J., 2009: Minerály Borů a Cyrilova u Velkého Meziříčí. - Bory. Pauliš, P.: Nejzajímavější mineralogická naleziště Moravy a Slezska. Kuttna, Kutná Hora: 2001, s. 13-16. Staněk, J.: Asociace minerálů významnějších pegmatitových žil v Hatích u Dolních Borů na západní Moravě. Acta Musei Moraviae, Scientiae naturales, 1997, roč. 82, 3-19. Houzar, S.: Přehled minerálů amfibolitového lomu v Mirošově (západní Morava), Minerál, 1999, roč. 7, č. 4, s. 294-296. Flégr, T., Novák, M., & Cempírek, J. (2016). New occurrence of bosiite in the Řečice pegmatite, Czech Republic. P. Pauliš (2001): Nejzajímavější naleziště Moravy a Slezska. Kuttna, Kutná Hora. Velebil, D., Kráčmar, L.: Ložisko Borovec u Štěpánova (štěpánovský revír). Minerál, 2002, roč. 10, č. 3, s. 163-181. Koudelka, L.: Nález jednoho z největších krystalovaných rubelitů v Československu. Časopis pro mineralogii a geologii, 1978, roč. 23, č. 2, s. 213. Zoheir, B., Deshesh, F., Broman, C., Pitcairn, I., El-Metwally, A., & Mashaal, S. (2018). Granitoid-associated gold mineralization in Egypt: a case study from the Atalla mine. Mineralium Deposita, 53(5), 701-720. Helmy, H. M., Kaindl, R., Fritz, H., & Loizenbauer, J. (2004). The Sukari Gold Mine, Eastern Desert—Egypt: structural setting, mineralogy and fluid inclusion study. Mineralium Deposita, 39(4), 495-511. Peter Johansson (2011) Field excursion 4. The Pyhä-Luosto Fell area and the Luosto Amethyst Mine. in abstracts 25th International Applied Geochemistry Symposium, Rovaniemi, Finland. Verbal communication 2.8.2016 by Väinö Kotilainen, who helped prof Martti Lehtinen to move the big crystals to museum. NICOLAS, J. & de ROSEN, A. (1963): Le massif granitique des Colettes (Allier) et ses mineralizations. Bulletin de la Société Française de Minéralogie et de Cristallographie 86, 126-128. NICOLAS, J. & de ROSEN, A. (1963): Phosphates hydrothermaux de basse température et kaolinisation: la gorceixite du massif des Colettes (Allier) et les minéraux associes (hinsdalite). Bull. Soc. Franç. Minér. Cristallogr., 86, 379-385. BRGM, 1981 - Fiche BSS "Suc de Lavaux"
Hède Frédéric. ; Belot, Victor R. (1978) Guide des minéraux, coquillages et fossiles: où les trouver en France, comment les reconnaître et les collectionner (Guides Horay). Pierre Horay (Ed. ), 224 pp. -AA.VV. Le Règne Minèral – Minèralogie du Massif du Mont-Blanc – Hors Sèrìe V - 1999. Personnaly collected by M. Diot. J. Geffroy, J.A. Sarcia, J. Chervet : "Les Minéraux Uranifères Français", 1960, Institut National des Sciences et Techniques Nucléaires / Saclay - PUF. DE ASCENCAO GUEDES R. (2001). Découverte de cristaux de phénakite dans le massif de La Lauzière, Savoie, France. Le Règne Minéral n°41, p. 52. Editions du Piat. Belot, Victor R. (1978) Guide des minéraux, coquillages et fossiles: où les trouver en France, comment les reconnaître et les collectionner (Guides Horay). Pierre Horay (Ed. ), 224 pp. Le Cahier des Micromonteurs, 1989, (3), 3-10. Chauris, L. (2014): Minéraux de Bretagne, Les Editions du Piat, 85. Boisson, J. M. (1988) - Les monts d'Ambazac, Le Cahier des Micromonteurs, (2), 3-33. Bull. Soc. Franç. Minéralo. Cristallo. , 1974, 97, p. 522. 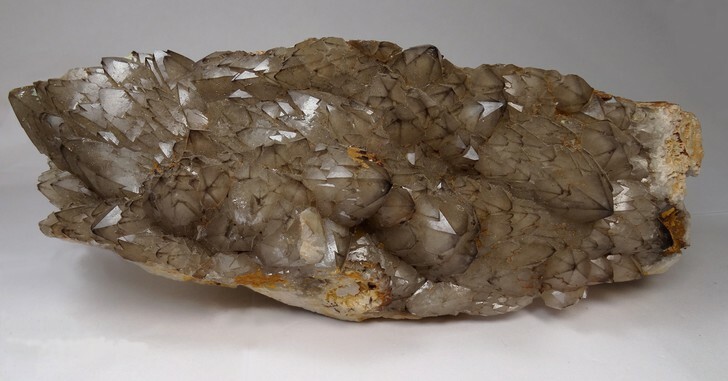 Goujou, J.-C., Cavard, J.-P. (2001): Les quartz "diamant" de la bordure sous-cévenol de Saint-Ambroix, Gard, Le Règne Minéral, 41, 34-40. Brill, A. R. (2011): Die Malsburger Granitsteinbrüche bei Kandern im südwestlichen Schwarzwald. Lapis 36 (7-8), 43-51; 70. Falkenstein, F. (2010): Ein bislang unbekanntes Mineral- und Fossilvorkommen im Porphyr-Steinbruch bei Detzeln, im südöstlichsten Schwarzwald. Aufschluss, 61, 157-74. KAISER, H. (1984): Die Grube Clara zu Wolfach im Schwarzwald. Verlag Karl Schillinger, Freiburg im Breisgau, 102 pp. Grimm, M.C. (1989): Beiträge zur Kenntnis der Pegmatite im Bayerischen Wald, 1: Ein Phosphatpegmatit NE Böbrach/Bayerischer Wald. Aufschluss, 40 (5), 325-338. Grimm, M.C. (1991): Beiträge zur Kenntnis der Pegmatite im Bayerischen Wald, 2: die Verbandsverhältnisse des Turmalinpegmatits Maisried bei Böbrach/Bayerischer Wald. Aufschluss, 42 (3), 179-192. Meier, S. (2007): Das Flötztal im südlichen Fichtelgebirge. Lapis 32, 17-20; 58. Weiss: "Mineralfundstellen, Deutschland West", Weise (Munich), 1990; Frankenberger, J. (2016): Rauchquarz mit "Paradoxit" vom Waldstein, Fichtelgebirge. Lapis, 41 (11), 32-37. Meier, S. (2009): Rutilkristalle aus der Grube Kreuzweiher bei Waldershof im Fichtelgebirge. Lapis, 34 (6), 53-55. O'Donoghue, M., ed. (1977): The Encyclopedia of Minerals and Gemstones. Rigby (Adelaide), 304 pp. Büchner, M. (1966) Zauber der Steine. Ausstellungskatalog der Sonderausstellung "Fossilien aus dem Mittleren Jura (Bathonien) von Bethel bei Bielefeld". Naturkunde-Abteilung des Städtischen Museums Bielefeld, Stapenhorststrasse 1. Kohout, K. (2008): Der Steinbruch Giro am Mannbühl: Spitzenfunde aus 27 Jahren. Lapis, 33 (5), 32-35. ; Bungert, R., Frey, W.-G. and Hesse, P. (2008): Die Mineralien des Steinbruch Giro am Donnersberg, Pfalz. Lapis 33 (3), 13-19; 50. Hartmut Hensel collection, Neustadt a. d. Wstr. Huhle, H. & G. Hohndorf (2013): Interessante Mineralienfunde aus dem Braunkohletagebau Amsdorf bei Halle a.d. Saale. Mineralien-Welt, 24( 6), 118-129. Hurtig, M. (2013): Schörl und Rauchquarz vom Elzing, Sachsen. Lapis 38 (1), 46-51. Vollstädt, H. (1979): Einheimische Minerale, VEB Deutscher Verlag für Grundstoffindustrie, Leipzig, p. 289. M Adelt collection; Tröger, S. (2009): Der Steinbruch Fahsel im Eibenstocker Granit, Westerzgebirge. Lapis 34 (6), 49-52. Frenzel, A. (1874): Mineralogisches Lexicon für das Königreich Sachsen, Leipzig. Haake, R., Flach, S., Bode, R. (1994): Mineralien und Fundstellen Deutschland, Teil 2, S.71-75. Herrmann, S. & Martin, M. (2007): Reicher Neufund: Torbernit aus Schneeberg/Sachsen. Lapis 32 (11), 26-31. Grütze, T. (2006): Rauchquarz und Kugelpyrite aus dem Steinbruch Naundorf bei Freiberg/Sachsen. Lapis 31 (12), 16-19. Stammnitz, T. (2010): Eine Fundstelle, sieben Drusen - und die achte sollte die Größte und Beste werden! Mineralien-Welt 21 (6), 64-67. Tröger, S. (2008): Der Bergbau um Gottesberg im Sächsischen Erzgebirge. Lapis 33 (2), 22-27; 50. Rüger, F. (2009): Die Mineralien des Kuhbergbruchs Neumühle in Thüringen. Lapis 34 (6), 25-30; 43-47; 70. McCandlish, K. (2003). Qualifying Report for the First Disclosure of a Resource Estimate on a Material Property Wassa Mine, Southwest Ghana. Oberthür, T., Weiser, T., Amanor, J.A., and Chryssoulis, S.L. (1997): Mineralium Deposita 32, 2-15. Lapis, 33 (5), 2008, 36-39. Gabriel Voicu (1999) Geology, Geochemistry and Metallogeny of the Omai Gold Deposit, Guiana Shield, South America. PhD Thesis University of Quebec Chicoutimi. Singh, Y., Rai, S. D., Sinha, R. P., & Kaul, R. (1991). Lithium pegmatites in parts of Bastar Craton. Exploration and Research for Atomic Minerals, 4, 93-108. Ottens, B. (2010): Bergkristalle aus dem indischen Himalaya. Lapis 35 (9), 13-21; 62. Piccoli, G.C., Maletto, G., Bosio, P., Lombardo, B. (2007). Minerali del Piemonte e della Valle d'Aosta. Associazione Amici del Museo "F. Eusebio" Alba, Ed., Alba (Cuneo) 607 pp. - Maida, F. (2002): Descrizione delle specie e varietà di minerali e loro ritrovamento nella bergamasca. G.O.M. Gruppo Orobico Minerali - Novecento Grafico, Ed., Bergamo 82 pp. Pezzotta, Federico and Guastoni, Alessandro, The New Discovery of a LCT Pegmatite in the Adamello Massif, Central Southern Alps, Italy; Museo Civico di Storia Naturale, Milan, Italy. ; Diella, V., Pezzotta, F., Bocchio, R., Marinoni, N., Cámara, F., Langone, A., Adamo, I., Lanzafame, G. (2018): Gem-quality tourmaline from LCT pegmatite in Adamello Massif, Central Southern Alps, Italy: An investigation of its mineralogy, crystallography and 3D inclusions. Minerals 8, 593. Guastoni, A., Pozzi, G., Secco, L., Schiazza, M., Pennacchioni, G., Fioretti, A. M., & Nestola, F. (2016). Monazite-(Ce) and Xenotime-(Y) From An Lct, NYF Tertiary Pegmatite Field: Evidence From A Regional Study In the Central Alps (Italy and Switzerland). The Canadian Mineralogist, 54(4), 863-877. - Piccoli, G.C. (2002): I minerali delle Alpi Marittime e Cozie. Provincia di Cuneo. Associazione Amici del Museo "F. Eusebio" di Alba, Ed., Alba, 362 pp. Piccoli G.C. (2002): Minerali delle Alpi Marittime e Cozie. Provincia di Cuneo. Amici del Museo "F. Eusebio" di Alba, Ed., Alba, 366 pp. ; Piccoli G. C., Maletto G., Bosio P., Lombardo B. (2007): Minerali del Piemonte e della Valle d'Aosta. Associazione Amici del Museo "F. Eusebio" di Alba, Ed., Alba, 607 pp. Nicolis de Robilant, E.B. [Nicolis di Robilant, S.B.] (1784-85) Essai géographique suivi d’une topographie souterraine, minéralogique et d’une docimasie des Etats de S. M. [Sa Majesté] en terre ferme. Mémoires de l’Académie Royale des Sciences, Turin, 1 (1786, pt.1), 191-304; Barelli, V. (1835) Cenni di statistica mineralogica degli Stati di S.M. il Re di Sardegna, ovvero Catalogo ragionato della raccolta formatasi presso l'Azienda Generale dell'Interno. Tipografia Giuseppe Fodratti, Torino, 686 pp. ; Jervis, G. (1873) I tesori sotterranei dell'Italia. Vol. 1: Regioni delle Alpi. Ermanno Loescher, Torino, XV+410 pp. ; Piccoli, G.C., Maletto, G., Bosio, P., and Lombardo, B. (2007) Minerali del Piemonte e della Valle d'Aosta. Associazione Amici del Museo "F. Eusebio" di Alba, L'Artigiana Srl - Azienda Grafica, Alba (Cuneo), 607 pp. Mattioli, V. (1979) Minerali Ossolani. Ed. Arti Grafiche Medesi, Milano, 268 pp. ; Albertini, C. (1991) L'Alpe Devero ed i suoi minerali. Edizioni Grafica P.G.A., Dormelletto (Novara), 299 pp. Mattioli, V. (1979): Minerali Ossolani. Ed. Arti Grafiche Medesi, Milano, 268 pp. Mattioli, V. (1979) Minerali Ossolani. Ed. Arti Grafiche Medesi, Milano, 268 pp. ; Piccoli, G.C., Maletto, G., Bosio, P., and Lombardo, B. (2007) Minerali del Piemonte e della Valle d'Aosta. Associazione Amici del Museo "F. Eusebio" di Alba, L'Artigiana Srl - Azienda Grafica, Alba (Cuneo), 607 pp. Piccoli G.C., Maletto G., Bosio P., Lombardo B. (2007): Minerali del Piemonte e della Valle d'Aosta. Associazione Amici del Museo "F. Eusebio" Alba, Ed., Alba, 607 pp. Alberto Vaghi collection; Mattioli V. (1976): Località mineralogiche consigliate. Ghiacciaio del Forno e adiacenze (Val Formazza - Ossola). Notizie Gr. Mineral. Lombardo, 7, 3 (sett. 1976), 56-58. - Conti-Vecchi, G. & Stara, P.(1991): Minerali della Sardegna, Della Torre Edizioni, Cagliari, 276 pp. Gamboni, A., Gamboni, T., Nonnis, O. (1997): I minerali dell'arcipelago di La Maddalena. Paolo Sorba, Ed., La Maddalena, 100 pp. • Gamboni, A. & Gamboni, T. (1994): I minerali di Cala Francese, Isola di La Maddalena. Rivista Mineralogica Italiana, 1994, 301-316. - Gamboni, A. and Gamboni, T. (2006). Gallura, tesori nel granito (i minerali delle pegmatiti granitiche). Webber Ed., Sassari, 190pp. • Gamboni, A. & Gamboni, T. (2006). Gallura, tesori nel granito (i minerali delle pegmatiti granitiche). Webber Ed., Sassari, 190pp. Gamboni, A., Gamboni, T. (2006) Gallura, tesori nel granito. I minerali delle pegmatiti granitiche. J. Webber Editore, Sassari, 190 pp. - Conti-Vecchi, G. & Stara, P. (1991): Minerali della Sardegna. Edition Della Torre, Cagliari, 276 pp. Stara, P., Rizzo, R., Brizzi, G. (1993) Sarrabus. Miniere e Minerali. Associazione Mineralogica Sarda, Gruppo Mineralogico Lombardo, Associazione Piemontese Mineralogia Paleontologia e Mostra Torinese Minerali, Centro Mineralogico Varesino, Amici Mineralogisti Fiorentini, Gruppo Mineralogico Paleontologico Piacentino, et al., Stige Milano Srl, Milano, 208 pp. Dallinger, R. (2002): Südtirols alpine Zerrklüfte. Zauberwelt und Mineralienvielfalt vom Pfitschtal bis zur Rötspitze. In: Wachtler M. (ed. ), Südtirol und die Dolomiten. Extra Lapis, 22, 24-33. Nannoni, R., & Marinai, V. (2008). Monte Spinosa. Nuovi ritrovamenti alle miniere Maffei e Montorsi. Rivista Mineralogica Italiana, 2/2008, 98-111. Thomas, R., P. Davidson, & A. Hahn (2008): Ramanite-(Ce) and ramanite-(Rb): New cesium and rubidium pentaborate tetrahydrate minerals identified with Raman spectroscopy: American Mineralogist 93, 1034-1042. Baldi M., 1982. La miniera del Pollone a Valdicastello. Riv. Miner. Ital., 6: 46-58. Brizzi G., Meli R., 1996 - I minerali della formazione ofiolitica dell'Impruneta (FI). - Riv. Mineral. Ital., 20 1: 81-98. Dini et al., 1998. Le vene di quarzo del Complesso Metamorfico dei Monti Pisani (Toscana): caratterizzazione strutturale, mineralogia ed inclusioni fluide. Atti Soc. Tosc. Sci. Nat., Mem., Serie A, 105: 113-136. Brigatti, M. F., Mottana, A., Malferrari, D., & Cibin, G. (2007). Crystal structure and chemical composition of Li-, Fe-, and Mn-rich micas. American Mineralogist, 92(8-9), 1395-1400.
widespread in numerous collections; Yamada, S. (2004) Nihonsan-koubutsu Gojuon-hairetsu Sanchi-ichiranhyou (111 pp. ); ex-Okamoto collection, now (2015) on display at Hakusekikan museum, Hirukawa. Alfredo Petrov specimens, received from Colorstone Mithrill, Tokyo. Horne, J.E.T., Butler, J.R. (1965) A Second occurrence of Lyndochite. Mineralogical Magazine, 34:268, 237-248. Guigues, J. (1955) Étude des gisements de pegmatite de Madagascar (Deuxième partie). Travaux du Bureau Géologique de Madagascar 67, Service Géologique, Tananarive, p. 6-8. Wolfgang Hampel, site visit August 2005. Besairie, H. (1966): Les Gites Minéraux de Madagascar. Annales Géologiques de Madagascar, Tananarive. 34: 390. Rakotoarison, W. (1964): Les pegmatites de la Sahatany. Archive du Service Géologique Madagascar. A.1983, p.1-39. Rakotoarison, W. (1964): Les pegmatites de la Sahatany. Archive du Service Géologique Madagascar. A.1983, pp.1-39. De Vito, C., Pezzotta, F., Ferrini, V., and Aurisicchio, C. (2006): Nb-Ti-Ta oxides in the gem-mineralized and "hybrid" Anjanabonoina granitic pegmatite, central Madagascar: A record of magmatic and postmagmatic events. Canadian Mineralogist 44, 87-103. Alsace, C. (1963) Etude Geologique et prospection de la feuille Faratsiho. Travaux du Bureau geologique nr 112, Service Geologique, Tananarive. Alsac, C.(1963): Etude Geologique et prospection de la feuille Faratsiho. Travaux du Bureau geologique nr 112, Service Geologique Tananarive. Rocks & Min. : 63:456; Panczner (1987): 87-251. Jindřich Kynický, Ondřej Jaroš. Drahé kameny miarolitických pegmatitů masívu Gorkhi v Mongolsku. Ashworth, L. (2014). Mineralised Pegmatites of the Damara Belt, Namibia: Fluid inclusion and geochemical characteristics with implications for post-collisional mineralisation (Doctoral dissertation, Faculty of Science, University of the Witwatersrand). Jahn, S. (2010): Blue Beauties - Jeremejewit-Neufund auf der Farm Ameib, Namibia. Mineralien-Welt 21 (4), 31-33. Jahn, S. & Bast, R. (2006): Der Krantzberg bei Omaruru, Namibia, und die Mineralvorkommen in seiner Umgebung. Mineralien-Welt 17 (3), 32-48. 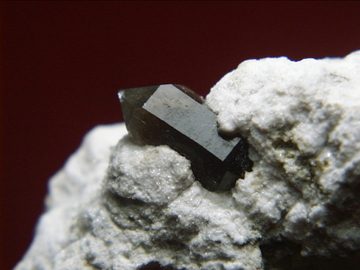 Locker, H. (2011): "Alpine" Rutile und Quarzkristalle: Rooisand am Gamsberg/Namibia. Lapis 36 (7-8), 21-25. Niedermayr, G. (2008): Talk on mineralogical news from Namibia. Beck, R.J. (1971) Stewart Island pegmatites. New Zealand Lapidary Journal. No. 5, 13-17. Larsen, K. E. (2015). Noen funn av mineraler i Norge 2013-2015. Norsk Mineralsymposium 2015, 79-88. Müller, A., Ihlen, P.M., Kronz, A. (2006): Potential resources of quartz and feldspar raw material in Sørland IV: Relationships between quartz, feldspar and mica chemistry and pegmatite type. NGU report 2005.075, 94 pp. Geological Survey of Norway. The Industrial Mineral Database. Deposit Area 928 - 337. Orremyråsen (Updated 27. Apr. 2007). Ihlen P.M., Henderson I., Larsen, R.B., Lynum R. (2001): Potensielle ressurser av kvarts- og feltspatråstoffer på Sørlandet, I: Regional prøvetakning av utvalgte feltspatbrudd i Frolandsområdet. NGU Rapport 2001.044, 46 pp. Jan Roger Moe collection; Larsen, K. E. (2015). Noen funn av mineraler i Norge 2013-2015. Norsk Mineralsymposium 2015, 79-88. Frigstad, O. F. (1999): Amazonittpegmatitter i Iveland-Evje. Bergverksmuseets Skrift 15: 60-73. Stokkeland, K. (2016) Formation of thortveitite and garnet geochemistry in the Evje-Iveland pegmatite field. Master Thesis in Geosciences, University of Oslo. 151p. Anonymous: (1983): Jensen-skjerpene ( P4-16). DG-nytt [A local magazine for the Drammen geological society, Norway] nr 5, 1983, p.14. Nordrum, F.S. (1999): Nyfunn av mineraler i Norge 1998-1999. Norsk Bergverksmuseum Skrift. 15: 87-90. Anonymous: (1983): Hørtekollen flusspatgruve (D5-01). DG-nytt [A local magazine for the Drammen geological society, Norway] nr 9, desember 1983, p.13. Andersen, K. H. (2008): Schöne Quarz-Kristalle aus Hattfjelldal, Nordland, Norwegen. Mineralien-Welt 19 (6), 66-69. Nielsen, R. B. (1980): Gjøvik-Ametystens tragiske skjebne. NAGS-nytt. 7 (4), 11-13. Samuelsen, Helge. (1992): Mineraler frå Vikafjellet. STEIN 1992 (2), 79-82. Bergstøl, S. and Juve, G. (1988) Scandian ixiolite, pyrochlore and bazzite in granite pegmatite in Tørdal, Telemark, Norway. Mineralogy and Petrology, 38, 229-243. Hyrsl & Rosales (2003) Mineralogical Record, 34, 241-254.; Hyrsl & Rosales (2003) Mineralogical Record, 34, 241-254. JANECZEK J., 1985: Typomorphic minerals of pegmatites of Strzegom-Sobótka Massif. Geologia Sudetica, 20 /2 (in Polish with English abstract). Kocher, A. (2010): Bavenit aus Striegau, Polen. Lapis 35 (7-8), 74. ŁAPOT W., SZEŁĘG E., 2003: Moonstone from the Karkonosze pegmatites (the Sudety Mountains, Poland). Miner. Polon., Vol. 34, No 1. JANECZEK J., SZEŁĘG E., 1998: Bastnäsite-(Ce) and synchysite-(Ce) from pegmatite and hydrothermally altered granite of the Strzegom-Sobótka Massif. Miner. Polon., 29 (2), 3-11. Found by students University of Wroclaw per Dagmara Lesiow. Bello, A. de Oliveira, 1910, Minéraux Portugais - Bulletin de la Société Portugaise des Sciences Naturelles, Vol IV, fasc. 2, Livraria Ferin, Lisboa. Cassat, Y. M. F. D., & Orlandi, A. (1989). Rittmannite, a new mineral species of the whiteite group from the Mangualde granitic pegmatite, Portugal. Canadian Mineralogist, 27, 447-449. LNEG - Laboratório Nacional de Energia e Geologia, Siorminp databse ref "1285U"
Correia Neves, J.M. (1962), Pegmatito da Região da Venturinha (Penalva do Castelo, Viseu), Memórias e Noticias do Museu e Laboratório Mineralógico e Geológico da Universidade de Coimbra, vol. 54, 1962: 1-135. J.M. Cotelo neiva (1944) Jazigos portugueses de cassiterite e de volframite. Comunicações dos Serviços Geológicos de Portugal, Tomo XXV: 251pp. Costin, D., and Vlad, S. (2005): Geochemistry, Mineralogy and Petrology (Sofia) 43, 64-68; Cook, N. J. Mineralogisches Institut der Universität Würzburg Am Hubland, D-97074 Würzburg Lecture to the Austrian Mineralogical Society 23 rd June 1997 in Salzburg. Rakov, L. T., Tkachev, A. V., & Sakhnov, A. A. (2013) Genetic analysis of quartz from pegmatites of the Mama-Chuya mica belt based on distribuition of isomorphic impurities, Russia. Geology of Ore Deposits, 55(1), 41-58. Bailey, J. C: Formation of cryolite and other aluminofluorides: A petrologic review. Bull. geol. Soc. Denmark, vol. 29, pp. 1-45. Copenhagen, June 10th, 1980. Repina, S.A. (2008): Geology of Ore Deposits 50(7), 609-619. Pekin, A.A. [Пекин, А.А.] (2010) Minerals of Moscow [Минералы Москвы]. Rossiiskii Khimicheskii Zhurnal [Российский Химический Журнал], 54, 2, 115-123 (in Russian); Pekin, A.A. (2011) Minerals of Moscow. Russian Journal of General Chemistry, 81, 6, 1381-1391. Mikhailov, B.M. (2000): Lithology and Mineral Resources 35(4), 351-364. Reyf, F.G. (1997): Mineralium Deposita 32, 475-490. Rainer Thomas, Paul Davidson and Elena Badanina (2010) Water- and Boron-Rich Melt Inclusions in Quartz from the Malkhan Pegmatite, Transbaikalia, Russia. Minerals 2012, 2, 435-458. Peretyazhko, I. S., Zagorsky, V. Y., Smirnov, S. Z., & Mikhailov, M. Y. (2004). Conditions of pocket formation in the Oktyabrskaya tourmaline-rich gem pegmatite (the Malkhan field, Central Transbaikalia, Russia). Chemical geology, 210(1), 91-111. Badanina, E.V., Gordienko, V.V., Wiechowski, A., and Friedrich, G. (2008): Geology of ore Deposits 50(8), 772-781. Prokof’ev, V.Y., Zorina, L.D., Kovalenker, V.A., Akinfiev, N.N., Baksheev, I.A., Krasnov, A.N., Yurgenson, G.A., and Trubkin, N.V. (2007): Geology of Ore Deposits 49(1), 31-68. Daltry, V.D.C. and von Knorring, O. (1998) Type-mineralogy of Rwanda with particular reference to the Buranga pegmatite. Geologica Belgica: 1: 9-15. Fridrichová, J., Bačík, P., Illášová, Ľ., Kozáková, P., Škoda, R., Pulišová, Z., & Fiala, A. (2016). Raman and optical spectroscopic investigation of gem-quality smoky quartz crystals. Vibrational Spectroscopy, 85, 71-78. Regásek F. (ed.) (1964): Legenda k mape nerastných surovín ČSSR 1 : 200 000 M-34-XXXII Zvolen. ŠGÚDŠ, Bratislava, 41 p.; Grecula P. (1971): Žilné ložiská kremeňa na Slovensku. Miner. Slovaca, 3, 12-13, 349-370.; Fridrichová, J., Bačík, P., Illášová, Ľ., Kozáková, P., Škoda, R., Pulišová, Z., & Fiala, A. (2016). Raman and optical spectroscopic investigation of gem-quality smoky quartz crystals. Vibrational Spectroscopy, 85, 71-78. Pauliš P., Ďuďa R., 2002: Nejzajimavejší mineralogická nalezište Slovenska. Kuttna, Kutná Hora, 134p. Koděra, M., a kol. : Topografická mineralogie Slovenska. Sv. 1 A-Kl, Bratislava, Veda 1986, s. 448-472. Cairncross, B. and Dixon, R., (1995) Minerals of South Africa. The Geological Society of South Africa, 236 pp. Cairncross, B. and Dixon, R., (1995) Minerals of South Africa. The Geological Society of South Africa. ⓘ Morón de la Frontera ? On display at the GEO Sevilla Exosition, organized jointly by the C.S.I.C. and the Universidad de Sevilla, inaugurated 26th July, 2010. Calvo, M. (2016). Minerales y Minas de España. Vol. VIII. Cuarzo y otros minerales de la sílice. Escuela Técnica Superior de Ingenieros de Minas de Madrid. Fundación Gómez Pardo. 399 págs. - Curtó, C.; Mérida, J.C.; Evangelio, S.: Las amatistas de la cantera Massabé, Sils, Girona. Revista de Minerales, vol.III, nº 3 Marzo 2007. Jiménez Martínez, R., González Laguna, R., Lozano Fernández, R.P., Paradas Herrero, Á., Baeza Chico, E., Torres Matilla, M.J. y Cabrera Andonaegui, B. 2013. Colección de Minerales de las Comunidades y Ciudades Autónomas del Museo Geominero: Catálogo de la Comunidad de Madrid. Cuadernos del Museo Geominero, 16, publicación en CD-ROM. Calvo, Miguel. (2016). Minerales y Minas de España. Vol. VIII. Cuarzo y otros minerales de la sílice. Escuela Técnica Superior de Ingenieros de Minas de Madrid. Fundación Gómez Pardo. 399 págs. Calvo, M. (2016). Minerales y Minas de España. Vol VIII. Cuarzo y otros minerales de la sílice. Escuela Técnica Superior de Ingenieros de Minas de Madrid. Fundación Gómez Pardo. 399 págs. Dissanayake, C. B., Chandrajith, R. O. H. A. N. A., & Tobschall, H. J. (2000). The geology, mineralogy and rare element geochemistry of the gem deposits of Sri Lanka. BULLETIN-GEOLOGICAL SOCIETY OF FINLAND, 72(1/2), 5-20. Maphalala, R. M., & Trumbull, R. B. (1998). A geochemical and Rb-Sr isotopic study of Archaean pegmatite dykes in the tin belt of Swaziland. South African Journal of Geology, 101(1), 53-65. Stalder, H. A., Wagner, A., Graeser, S. and Stuker, P. (1998): "Mineralienlexikon der Schweiz", Wepf (Basel), p. 336. Stalder, H. A., Wagner, A., Graeser, S. and Stuker, P. (1998): "Mineralienlexikon der Schweiz", Wepf (Basel), p. 311. Stalder, H. A., Wagner, A., Graeser, S. and Stuker, P. (1998): "Mineralienlexikon der Schweiz", Wepf (Basel), p. 282. Stalder, H. A., Wagner, A., Graeser, S. and Stuker, P. (1998): "Mineralienlexikon der Schweiz", Wepf (Basel), p. 227. Stalder, H. A., Wagner, A., Graeser, S. and Stuker, P. (1998): "Mineralienlexikon der Schweiz", Wepf (Basel), p. 342. Stalder, H. A., Wagner, A., Graeser, S. and Stuker, P. (1998): "Mineralienlexikon der Schweiz", Wepf (Basel), p. 340. Stalder, H. A., Wagner, A., Graeser, S. and Stuker, P. (1998): "Mineralienlexikon der Schweiz", Wepf (Basel), p. 276. Stalder, H. A., Wagner, A., Graeser, S. and Stuker, P. (1998): Mineralienlexikon der Schweiz. Wepf (Basel), p. 131. Guastoni, A., Pozzi, G., Secco, L., Schiazza, M., Pennacchioni, G., Fioretti, A. M., & Nestola, F. (2016). Monazite-(Ce) and xenotime-(Y) from an LCT, NYF Tertiary pegmatite field: Evidence from a regional study in the Central Alps (Italy and Switzerland). The Canadian Mineralogist, 54, 4, 863-877. Guastoni, A., Pozzi, G., Secco, L., Schiazza, M., Pennacchioni, G., Fioretti, A. M., Nestola, F. (2016) Monazite-(Ce) and xenotime-(Y) from an LCT, NYF Tertiary pegmatite field: Evidence from a regional study in the Central Alps (Italy and Switzerland). The Canadian Mineralogist, 54, 4, 863-877. Guastoni, A. (2012) LCT (lithium, cesium, tantalum) and NYF (niobium, yttrium, fluorine) pegmatites in the Central Alps. Proxies of exhumation history of the Alpine nappe stack in the Lepontine Dome. Ph.D. Thesis. University of Padova, Dept. of Geosciences, 159 pp. Stalder, H. A., Wagner, A., Graeser, S. and Stuker, P. (1998): "Mineralienlexikon der Schweiz", Wepf (Basel), p. 337. Robert L. Parker (1973) Die Mineralfunde der Schweiz. Stalder, H. A., Wagner, A., Graeser, S. and Stuker, P. (1998): "Mineralienlexikon der Schweiz", Wepf (Basel), p. 338. Lieber, W. (1977) Charakteristisch oder bedeutungslos? Die Farbe von Mineralien. Mineralien-Magazin, 1, 17-23. Stalder, H. A., Wagner, A., Graeser, S. and Stuker, P. (1998): "Mineralienlexikon der Schweiz", Wepf (Basel), p. 362. Stalder, H. A., Wagner, A., Graeser, S. and Stuker, P. (1998): "Mineralienlexikon der Schweiz", Wepf (Basel), p. 302. Amacher, P. (1987): Mineralienfreund 25(2), 25-30. Stalder, H. A., Wagner, A., Graeser, S. and Stuker, P. (1998): "Mineralienlexikon der Schweiz", Wepf (Basel), p. 341. Stalder, H. A., Wagner, A., Graeser, S. and Stuker, P. (1998): "Mineralienlexikon der Schweiz", Wepf (Basel), p. 167-168. Stalder, H. A., Wagner, A., Graeser, S. and Stuker, P. (1998): "Mineralienlexikon der Schweiz", Wepf (Basel), p. 324.